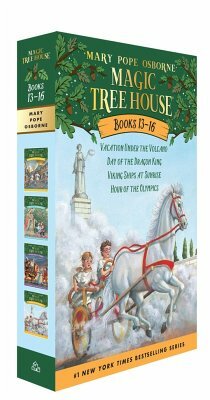 Morgan, the magical librarian of Camelot, sends Jack and Annie to four ancient worlds in this boxed set of exciting Magic Tree House adventures: "#13: Vacation Under the Volcano, #14: Day of the Dragon King, #15: Viking Ships at Sunrise," and "#16: Hour of the Olympics." A bonus Magic Tree House poster is included. The #1 bestselling chapter book series of all time celebrates 25 years with new covers and a new, easy-to-use numbering system! Jack and Annie must save stories that have been lost in history. Morgan, the magical librarian of Camelot, sends them to find the books in the ancient worlds of Roman Pompeii, imperial China, Dark Age Ireland, and classical Greece. Will Jack and Annie be able to save the stories in their darkest hours…or will the books be lost forever? Books in this set include: Vacation Under the Volcano (#13), Day of the Dragon King (#14), Viking Ships at Sunrise (#15), and Hour of the Olympics (#16). Did you know that there's a Magic Tree House book for every kid? Magic Tree House: Adventures with Jack and Annie, perfect for readers who are just beginning chapter books Merlin Missions: More challenging adventures for the experienced reader Super Edition: A longer and more dangerous adventure Fact Trackers: Nonfiction companions to your favorite Magic Tree House adventures Have more fun with Jack and Annie at MagicTreeHouse.com! MARY POPE OSBORNE is the author of the New York Times number one bestselling Magic Tree House series. She and her husband, writer Will Osborne (author of Magic Tree House: The Musical), live in northwestern Connecticut with their three dogs. Ms. Osborne is also the coauthor of the companion Magic Tree House Fact Trackers series with Will, and with her sister, Natalie Pope Boyce. SAL MURDOCCA has illustrated more than 200 children's trade and text books. He is also a librettist for children's opera, a video artist, an avid runner, hiker, and bicyclist, and a teacher of children's illustration at the Parsons School of Design. Sal lives and works in New York with his wife, Nancy.